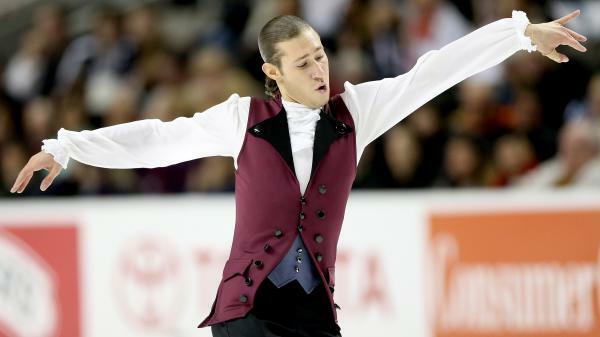 Jason Brown competed in the men's short program during the 2018 U.S. Figure Skating Championships in San Jose, Calif., with a song from Hamilton, the musical. The decision came as the governing body hopes to reach a wider audience — and after the U.S. Championships it seems like that may be working. At the U.S. National Championships in San Jose, Calif., skater Jimmy Ma started his short program routine with music that left the commentators disagreeing about what genre it was. Then about halfway through, the bass dropped and Lil Jon's voice belted out "turn down for what?" That's when the crowd went crazy. Audiences should expect to see more routines set to music with lyrics, be it from a rapper like Lil Jon or one of the many hits from Hamilton, USA Today sports reporter Maggie Hendricks told All Things Considered host Kelly McEvers, adding that it makes for fun, engaging moments on the ice. "And why not? Figure skating should be fun," she said. By allowing music with vocals, Hendricks says the audience can get to know the skaters in more ways than before, pointing out that for Ma chose a piece a very different piece, a composition by Sergei Rachmaninoff, for his long program. "So, you know, we have this balance of skater and learning about who they are in ways that we never could when you were having lyricless music or just classical pieces or opera pieces," she says. "You're just getting this whole new side of them." This is definitely the case with one of Hendricks' favorite skating performances to vocal music: Last year Yuzuru Hanyu, the reigning world champion and Olympic champion, chose to perform "Let's Go Crazy" by Prince at the International Skating Union's Grand Prix in 2016. "He's one of the best skaters to ever walk this earth," she says. "He has very much a rock star swagger. In Japan, he is a rock star. The way he brings the spins, you start to see Prince's music happening on the ice when you see Yuzuru Hanyu skate to it. ... And even at one point, he sort of takes his leg behind his head and plays it like he's playing a guitar." Though many performances involving vocal music were a hit, Hendricks says sometimes they don't work out so well. "Tessa Virtue and Scott Moir are Canadian figure skaters ... an amazing pair, but in their short program they have — sandwiched between 'Oye Como Va' and 'Sympathy For The Devil,' — 'Hotel California' by The Eagles," Hendricks says. "It's just so disappointing." However, Ma's performance and others', including Jason Brown's and Bradie Tennell's, did catch the attention of some who expressed their approval of the policy change on Twitter. "When a figure skating program goes viral, there's somebody watching that somewhere and saying, 'hey, maybe I can try figure skating,' And that is a huge part of the Olympics ... every sport gets a little bump," Hendricks says. "It gets some people interested in it and trying it, because they've saw it and they saw something in it. "I don't know if all of the young kids out there would have necessarily seen something of themselves in the Rachmaninoff, but they sure as heck would see it in the Lil Jon version."